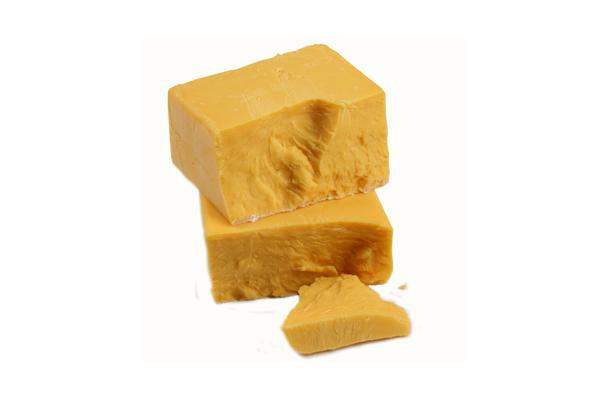 Brick cheese is a semi-hard, cow's milk cheese originating in Wisconsin. It was developed by John Joo in 1877. The cheese has a number of small and irregular holes and an open texture. The flavor is a mixture of sweet, spicy and nutty. As it ripens, it has a heady aroma and becomes almost as strong as limburger. The name brick cheese is said to have come from the fact that bricks were once used to weight the curd and press out the whey. Brick cheese is a medium-soft cheese that crumbles easily and is somewhat sticky to the knife. When young, brick cheese has a mild, sweet flavor. As it ages, brick cheese develops a more ripe, and strong. Brick cheese is named for the shape it's made in, either a rectangular, or square brick. Flavors: young; mild and sweet, spicy and nutty. aged; ripe and strong, heady. Brick cheese is well suited for being sliced for use on sandwiches. It also melts well and can be used in fondues, or sauces. History: Brick cheese is an American original, created in 1877 by John Jossi. In 1873 Jossi was in New York, working in an Limburger plant. During that time he envisioned making a cheese that began with drier curds than those used in the making of Limburger he was used to. In 1877 he returned to Wisconsin where he began running a newly built Wisconsin plant, and set out to develop Brick cheese. The name Brick cheese is attributed to both the bricks that are used to press the curds, and the brick shape of the molds themselves.